Muhlbergia is a variety of ornamental grass with spectacular showgirl flair. The common name is muhly grass and it is extremely hardy and easy to grow. What is muhly grass? Read on for muhly grass care and to learn how to grow ornamental muhly grass. The appeal the plant will give to your garden is well worth the effort. Muhly grass grows in clumps that are 3 to 4 feet tall. It is native to Florida and the eastern half of the United States. The grass is known for its pink to purple inflorescences which float above the body of the plant in an airy display worthy of a fairy princess. 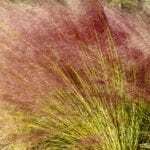 The show of color gives it the name pink muhly grass. There is also a white flowering variety. The plant has long sharp-edged foliage blades and can reach 3 feet in width. Known for its extreme drought tolerance, growing muhly grass is easy and requires little maintenance or upkeep. Plant your pink muhly grass in any type of soil, so long as it drains well. Muhlbergia does not like wet feet. It is naturally found along highways, in flat forests and along coastal dunes, so it is important to match the natural growing range of the plant. Plant several together but spaced at least 2 feet apart for an eye popping effect. The lighting should be as bright and sunny as you can find in your garden. With the exception of light trimming if you wish, this grass thrives on cruel neglect. It tolerates rocky soil where there is little organic matter and merciless sun and dryness. It can even tolerate flooding for short periods. Water frequently when growing muhly grass babies, but once the grass is mature, you only need to give supplemental water when periods of drought are severe. You can feed the plants in spring with a diluted by half balanced plant food and water when the soil is dry in the top couple of inches. Other than that, there isn’t a lot to do for this beautiful grass. The grass is semi-evergreen but you may want to cut it back in early spring to remove any brown blades and make way for new green growth. One other aspect of muhly grass care is division. You can divide the plants every three years to keep them in an upright habit and producing plenty of inflorescences. Simply dig up the plant in late fall to early spring. Cut apart the root ball into at least two pieces, being careful to include healthy roots and lots of green grass blades on each section. Replant the pieces in the ground or pots, and water frequently for the first couple of weeks as the grasses grow. Care of pink muhly grass divisions is the same as older more established plants.